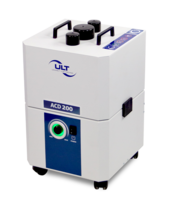 Introducing its redesigned ULT 200 unit series, ULT AG is not only providing a new device generation but a completely new system concept. At the heart of the concept, there are space-saving, modularly and extremely rugged designed systems for the removal of laser and soldering fumes, dusts, gases, odors and vapors. Founded in 1994, ULT AG is a leading vendor of high efficiency fume extraction technology and process air drying solutions. The broad range of equipment has been designed for use in various industries, covering a wide range of applications. Among the solutions offered, there are standard products as well as custom-built units for special applications. ULT AG provides customers in Europe, Asia, North America and Australia with extraction and filtration systems for material processing as well as onsite services. The company has been DIN EN ISO 9001 certified for nearly 20 years. Additional information on ULT and its products can be found online at www.ult.de/en.